I wanted to create a discovery center centered around our literature for the week which was We're Going on a Bear Hunt and wondered how long shaving cream would last in a bottle to represent snow. I hopped on over to pinterest to see if anyone else had done the bottles and discovered this nifty post from Nestpirations, yay! While they used cotton balls for snow, I stuck with shaving cream and it lasted longer than the "grass" did as the grass got a bit funky in all that moisture but a week was all we needed and the children LOVED the bottles. They would gather them up for each story time and arrange them in order/sequence as we read the story each day. The grass came from my garden cut from a swath of some sort of floral pretty, the river is sand from our sandbox with water mixed in. Our forest is a gathering of sticks and leaves, the mud is potting soil and water, and the snow is shaving cream. The children really enjoyed our literature and would retell it as they played around the room. During snack and at lunch we would make the sounds from the book that went with each bottle. So much fun! So much fun that one of the kiddos decided to gather up ALL of our discovery bottles to create this awesome piece of art. He spent more than thirty minutes arranging all the bottles to his liking and asked me to take a picture of it telling me it was a dance. Swoon! For our week of We're Going on a Bear Hunt one of our activities was a nature walk around campus. In an ode to scrumdilly-do! circa 2007, we wrapped two strips of masking tape around each child's wrist, sticky-side out and went on a nature hunt. Most of the children in both classes chose to not wear their bracelets once they got to class so we carefully cut them off and places them on the windowsill near the nature table. The bracelets look really happy clustered all together. This was back in February and our nature table is now a math table and our windowsills are full of sprouting things so the bracelets have been stuck to the window frame looking even happier. I need to remember to take a picture and yes thye still stick! Labels: going on a bear hunt, in the classroom, nature craft, vintage scrumdilly-do! **Not a Box by Antoinette Portis is a classroom favorite. The children would often return to the boxes and themes of the story weeks later. I love how the books linger. This is why I love our literature based program. Forget the idea of marbling....the children in my class preferred to experiment with the paint and the shaving cream. It was available all day and a popular center, I think all of one print was actually made...two if you count the one I did.There were jars of liquid watercolor and eyedroppers scattered about. We talked about warm colors and cool colors and the children chose to have one tray of warm colors and one tray of cool colors. They were focused and intent on making sure their trays remained warm or cool. Fingers dipped into the shaving cream along with plastic spoons and measuring cups. At one point the paintbrushes came out and the children attempted to paint on top of the shaving cream. A glass of water was requested when they realized the cream would stick to their brush. 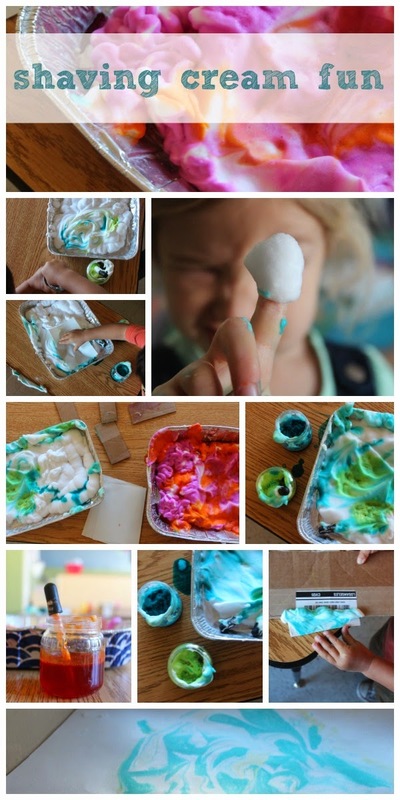 For making prints, the children dropped bits of color on top of the shaving cream then used the end of a paintbrush to swirl the colors a bit. Next a piece of paper was placed gently on top. Once the paper was removed the children noticed how completely covered with shaving cream it was. Small scraps of sturdy cardboard were used to scrape the shaving cream away revealing the marbled print underneath. It was a joyfully loud morning of investigation and experimentation. I made a batch of cinnamon scented play dough and added a few bear accessories added for fun. I picked up the bears from etsy seller Clickity Clack and highly recommend them. I added some oats as well as rolling pins, muffin pans, cookie cutters and measuring cups. The children really enjoyed baking porridge cookies and pie. 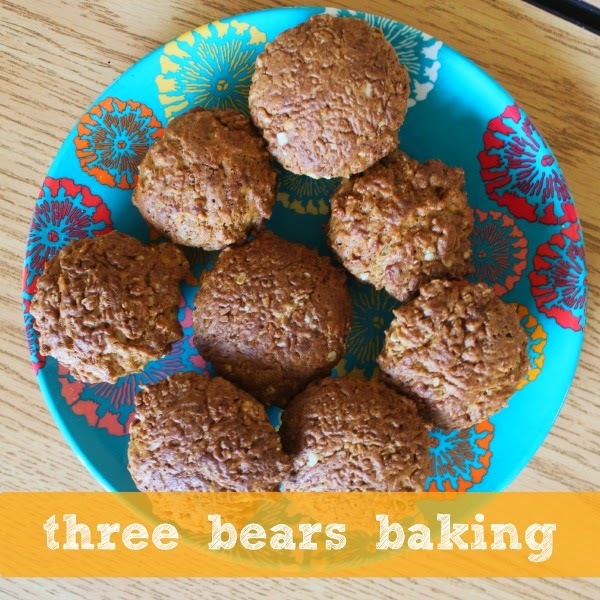 For our week of The Three Bears we created a porridge muffin recipe using our cupcake baker. For ingredients I set out all of the usual suspects along with three measuring spoons and three measuring cups. We bake a lot in class so the children know that we use flour, sugar, oil, eggs, and sometimes milk. I held up the measuring cups/spoons and named them...Papa Bear, Mama Bear, and Baby Bear. We began with flour and the children got to decide how many cups and which cup at that, of flour we needed. After flour, we added oats, then sugar, eggs, backing soda, baking powder, and a dash of cinnamon for good measure. The children really favored the Baby Bear measure and I decided to pose question about quantity once we had mixed everything up "Do you think this is enough batter for everyone to enjoy a muffin?" After a few rounds of negotiation, the children decided to add more oats and just a little more flour. We mixed and mixed and added one heaping cookie scoop to each cupcake well, closed the lid and plugged in the baker. The children know that the baker is off limits once the lid is closed and went about playing in the classroom until it was snack time. The children were so proud! The muffins were super dense and surprisingly NOT sweet and they ate every last crumb. We kind of had a field day with books of threes. We began with The Three Little Kittens, then moved on to The Three Billy Goats Gruff and ended our adventure with The Three Bears. For our week of The Three Bears we explored oats, size and mass, and of course...bears! 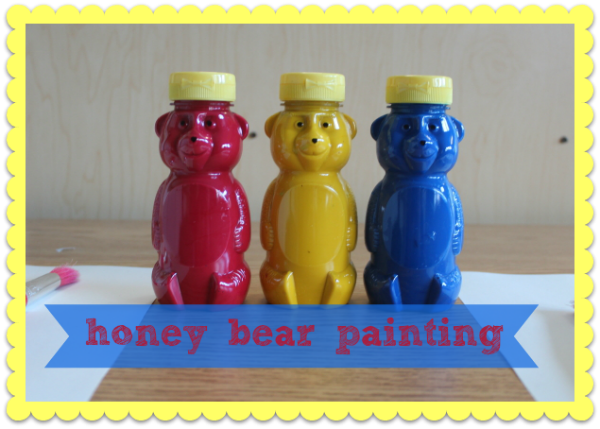 My favorite was painting with bear bottles, really it was less about painting with the bottles and more about the presentation. Rather than remove the entire seal from each bottle, I punched a hole or two in the seal with a toothpick. This kept the paint from being squeezed out completely on the first try and made the children work a little hard for their results (though the bottles are super sturdy and not exactly the easiest to squeeze). Setting out primary colors only had the children working from memory to mix up the colors they wanted. I had thought originally they would mix the paint onto the paper plates but they, of course, had other ideas. There was a request for glitter and other bits of pizazz. I never refuse glitter or pizazz. They found that their plates, when painted, looked like planets while the paper underneath was outer space. We will be revisiting this again as more talk of planets came up recently. I need to get some books and maybe I will read this one again, it's a rest time favorite. They each spent a longer than usual amount of time on their creations often going back to the window where we place our artwork to dry to bring their art back to the table for a little bit more paint of pizazz. The large bits of foil pizazz is a bit like this while the bear bottles came from here.